We love our team here at Great Aussie Holiday Park and its with great pleasure we introduce Kathryn, one of our awesome housekeeping team. To help you get to know Kathryn, she has answered a few questions. I’m pretty much a local, as I grew up in Burrumbuttock, and have been working for about 25 years now. I started working at 16, as a clerical assistant at Macquarie Worsteds in Albury and was there for four years. Then I worked at Safeway Albury for the next eight years. Then I had four babies, so was home for a bit. Since the kids were little I worked in pubs at nights and then got a winter job as a receptionist at H&$ Block four years ago for tax time. 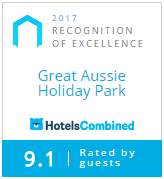 I joined the Great Aussie Holiday Park and have enjoyed working here for two and a bit years. I think I’m boring – others may disagree! I love the proximity of our region to everything – the river, the weir, the snow, the high country. They are all close by. I was young and paying off my car and I needed a job. I’ve been doing it on and off ever since. I love the satisfaction of a clean cabin, and when someone says a nice comment. If you see Kathryn around the park be sure to say hi!